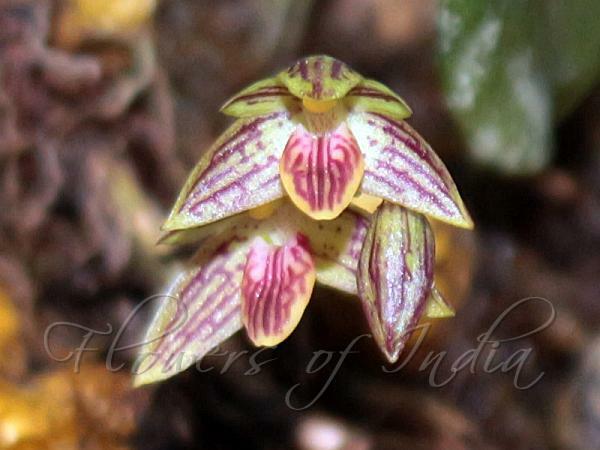 Striped Bulb-Leaf Orchid is a mini-miniature sized orchid, growing on rocks, with a slender, woody rhizome with 2-6 cm between each pear-shaped to ovoid, rugose, purple pseudobulbs. The plant carryies a single, erect, leathery, elliptic flat leaf with many veins, green above, purple blotched below, with a stalked base. The plant blooms in the fall arising from the rhizome or the pseduobulb base on a shorter than the leaf, slender, 2-4 flowered inflorescence, 5-8 cm long, umbel- to short-raceme-like, erect, strongly basally recurved. It has tubular basal sheaths and the upper ones distant, lanceshaped and pointed and has linear, pointed floral bract. Flowers are inverted, fully opening almost simultaneously, light greenish or yellowish green, veins purple, lip whitish green or yellow with purple lines; flower-stalk and ovary 10-17 mm. Dorsal sepal recurved, elliptic to ovate, 9-12 x 3.3-4.5 mm; lateral sepals free, oblique, triangular, 8.5-13.5 x 3.5-5 mm. Petals are recurved, elliptic to ovate-triangular, 4.5-7 x 1.8-2.4 mm. 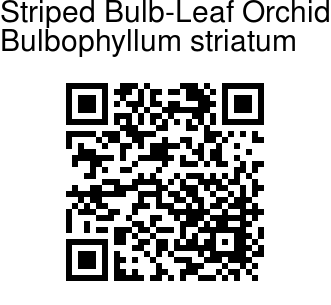 Striped Bulb-Leaf Orchid is found in Eastern Himalayas, from NE India to Bhutan, Nepal, Thailand, N Vietnam and Yunnan, at altitudes of 1000-2300 m. Flowering: January-February.